Whether changing the magnitude of speed or changing direction, the only source of motive force is propulsion. Since there is no lift, the propulsion system must provide all of force required. Because there is no atmosphere, the spacecraft must carry not only fuel but also the oxidizer required to burn the fuel. The total pro-pellant load, i.e. fuel and oxidizer, is many times greater than the fuel for an aircraft flying in Earth's atmosphere. Because rockets must carry oxidizer, the propellant weight (oxidizer + fuel) just to achieve LEO from Earth is from 7 to 15 times the unfueled weight of the spacecraft. It is for this reason that for spacecraft the measure of the total propellant carried is the ''mass ratio, MR'', or the total vehicle mass divided by the unfueled mass of the spacecraft. Table 1.5 gives for a number of current propellants their 7sp, density Isp = propellants specific gravity times 7sp, oxidizer to fuel ratio (O/F) and mass ratio MR required to accelerate from LEO orbital speed (25,656 ft/s or 7.820 km/s) to Earth escape speed (36,283 ft/s or 11.059 km/s) i.e. a velocity increment of 10,633 ft/s or 3.241 km/s. Nuclear-powered electric propulsion should be used in low Earth orbit, resulting in an improved mass ratio for a given incremental velocity. In Table 1.5 propellants in bold are hypergolic, that is they combust (or even detonate) on contact. Hyper-golics have the advantage that they are storable in space and have the highest density specific impulse. Those in italics are monopropellants that use the heat of a catalyst bed to decompose the liquid to a high temperature gas, and have the lowest specific impulse. 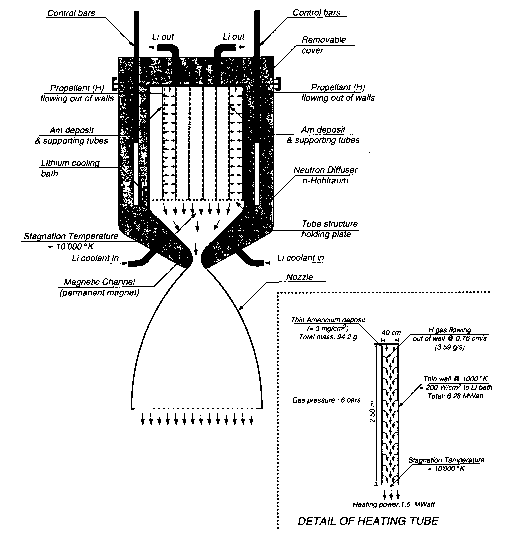 Hydrogen propellant used in nuclear rocket systems results in a low value for density specific impulse. The propellants are ranked in order of density times Isp (Sp.Gravity xIsp), where the bulk density of the propellant is expressed as bulk specific gravity; generally, the higher this value, the less propellant volume required. 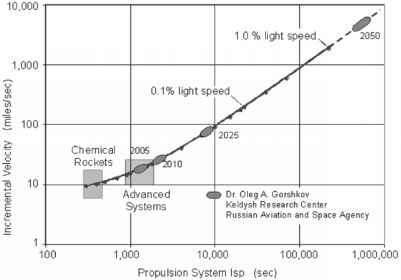 1,000 10,000 100,000 Propulsion System Isp (sec) Figure 1.5. Required specific impulse as a function of spacecraft speed with some projections. 11.059 km/s; the greatest speed is 4.85% light speed for the 2050 ellipse. The current hypergolic and cryogenic rockets and U.S. and European advanced systems are indicated. From a talk given by Dr Oleg A. Gorshkov of the Keldysh Research Center, the four capabilities that the center is working toward are indicated in Figure 1.5 with the approximate year of availability. The specific impulse required to reach 1% of light speed is at least two orders of magnitude greater than our expected advanced systems. Another two orders of magnitude are required if we are to attain light speed, i.e., four orders of magnitude greater than our expected advanced systems. That means achieving specific impulses of the order of one to ten million seconds. That means that each kilogram per second of propellant flow produces one to ten million kilograms of thrust (9.8 to 98 Mega-Newtons). We have yet to speak of superluminal speeds, that is, traveling faster than light speed, but superluminal speed cannot be achieved until at least light speed is achieved. Assuming we can achieve the speed enabled by the specific impulse (/sp) in Figure 1.5, the question is , how long is the travel time?